Hahaha, does it get nerdier than this? 😉 However, I'm missing some hat. Oh man, I read that as "Unwrap my sister". And yes, a matching hat would've been nice. 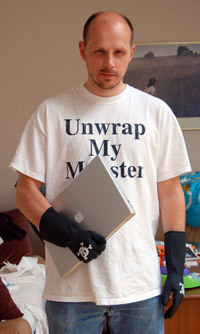 No, just for clarity's sake, then: it reads "Unwrap My Monster".